The $40 million Australian Government and State Government funded Regional Bridges Upgrade Program will improve road safety and increase freight efficiency by upgrading a number of bridges across South Australia’s regional road network at various locations in the Mid-North, Riverland, Clare Valley, Adelaide Hills and Barossa Valley. The Department of Planning, Transport and Infrastructure (DPTI) will undertake works to replace, strengthen and/or widening of selected bridge structures, which will help accommodate the use of larger vehicle classifications. In conjunction with the implementation of a range of localised road widening and junction upgrade works, this will help achieve the strategic objectives of improved safety, productivity and efficiency in the transports of goods via heavy vehicles. Works commenced January 21 2019 on the Rocky River Bridge on the Augusta Highway near Crystal Brook. Works include bridge widening, installation of new guard rails and bridge barriers and road shoulder widening works. Traffic diversion and speed restrictions are in place adjacent the Rocky River Bridge for all traffic throughout the course of the works. Traffic diversion and speed restrictions will be in place adjacent the Lyndoch and Stott Highway bridges for all traffic throughout the course of the works. 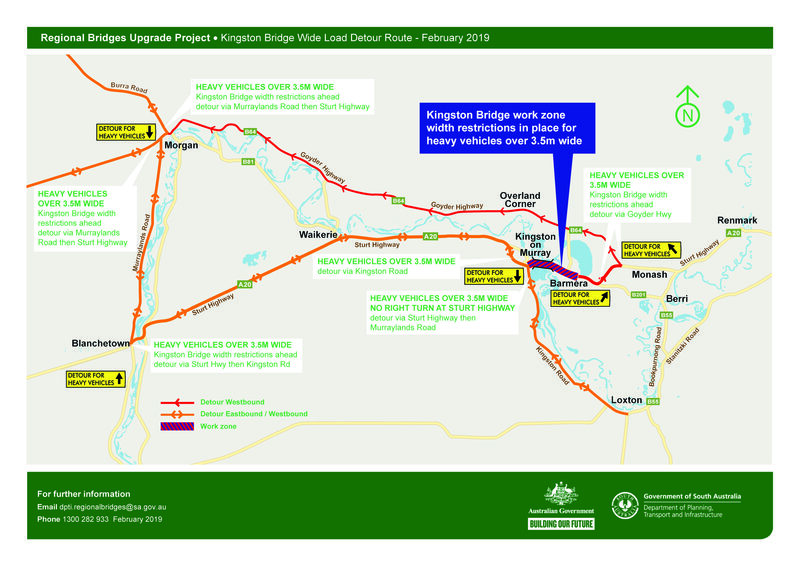 Works are scheduled to commence 5 March 2019 and will include the replacement of the existing bridge and an upgrade of the intersection of Onkaparinga Valley and River View Roads. Traffic diversion and speed restrictions will be in place adjacent the Inverbrackie Bridge for all traffic throughout the course of the works.